Happy Thanksgiving week everyone! Since it’s a holiday week, I’ve got an extra special treat for you – both a medical blog and a music blog! 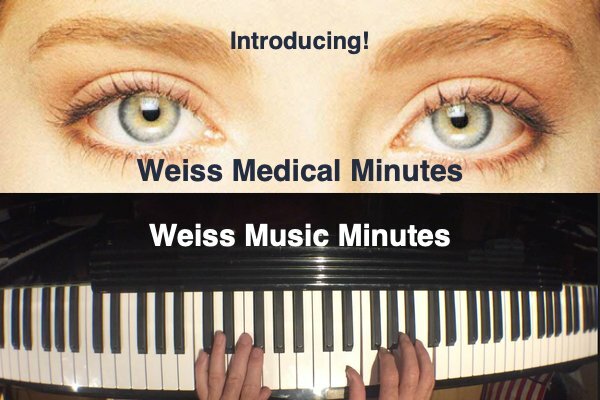 We’re all busy and short on time – so I’m introducing 2 new continuing features: Weiss Medical Minutes and Weiss Music Minutes. Each Weiss Medical Minute is approximately one minute long and contains a concise medical discussion or explanation. With Weiss Music Minutes I will try to make the case that many complete musical songs or ideas can be fully expressed in 60 seconds or less. Let’s see what you think. I hope your long weekend involves a lot of friends, family and love – things we can all be thankful for! Eyelid surgery is fairly quick and relatively pain-free, but everyone has questions! Here are answers some of your most common questions about eyelid surgery. Here’s a one-minute cover of the Tennessee Waltz, one of my favorite songs, written by Redd Steward and Pee Wee King.